The only gloss I can put on Netflix's association of Lars von Trier's Melancholia with Soderbegh's Solaris is that they are both interior dramas tangentially provoked by otherwise indifferent astrophysical phenomena. Once again, von Trier makes a woman (Justine) suffer while he condemns us for our petty, blind selfishness. Once again, mental illness in a dysfunctional society becomes a beatifying double-negative, but no one is redeemed. For me, von Trier's films succeed or fail depending on whether he can pull off the catharsis. I was cheering at the end of Europa (Zentropa) and Dogville, but I walked out of Breaking the Waves and Dancer in the Dark wanting to punch someone. Melancholia succeeds primarily on the strength of the performance of Kirsten Dunst, who I hope escaped from von Trier mostly unscathed. Charlotte Gainsbourg plays Justine's sister Claire, the only other human in the film, and Claire's relationship with Justine is all that survives the dénouement. The pre-title sequence, set to the Prelude from Wagner's Tristan and Isolde (get used to it now), is visually stunning, clearly violates Dogme, and is probably the only part of the film I'll ever need to watch again. Dunst is marvelous as Justine, mincing through her wedding reception, genuinely disappointed that she cannot pretend to be as happy as she knows everyone wants her to be. For once, a von Trier heroine is more adult than anyone around her. Aside from portraying von Trier's cartoon notion of an ad executive, Stellan Skarsgård is excused from his usual duty of brutalizing the protagonist. That role falls to John (Kiefer Sutherland), and even he lets the abuse accumulate in his tight eyes and tighter jaw rather than pouring it out on his wife, Claire. So Justine cannot find happiness in her marriage or her career, and in the second half of the film she returns to John & Claire's absurdly grandiose estate to convalesce while her serotonin levels align with the eschaton. Von Trier's prior films have depicted worlds more deserving of destruction than Justine's awkwardly banal wedding party, and it's difficult to work up much outrage over John's withholding of certain information. That John and Claire fail to prepare either themselves or their young son for the climax of Melancholia is no indictment, nor does von Trier intend it to be. But Dunst's Justine is so affectingly doleful that she seems serene by comparison. 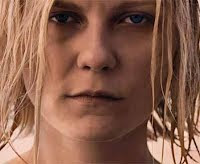 While Justine is marking the stations of the cross via the endless rituals of the wedding reception, Dunst's legendary smile buoys us through all indignities, and it's impossible to imagine anything dimming it for long. When we realize during the film's second act that it isn't coming back, that's when we're ready for the world to end.